This table must be populated with all Header details,along with the batch number.Header_interface_id is the primary key to all the other interface tables. This table must be populated with the line details,with proper header_interface_id . Line_interface_id is the primary key.Populate the Header_interface_id from oks_headers_interface. 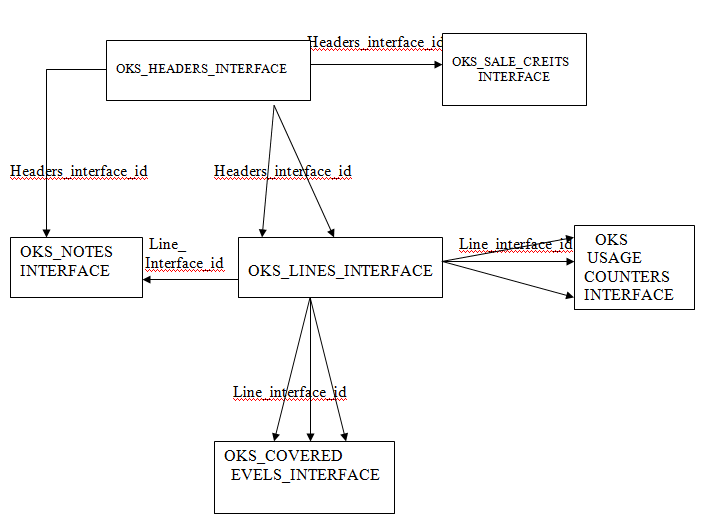 This table should be populated with all covered level details.covered_level_interface_id is the primary key.Populate line_interface_id from the oks_lines_interface. This table must be populated with the counter details. Usage_counter_interface_id is the primary key for this table.Line_interface_id must be populated from oks_lines_interface. Populate this table with required notes information. 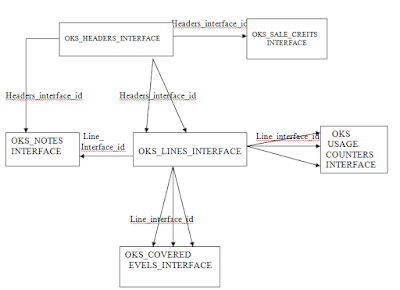 Notes_interface_id is the primary key.The header_interface_id and line_interface_id should be populated corresponding to the header_interface_id of the oks_headers_interface table and line_interface_id from the oks_lines_interface.